Episode 31, the last one for this first season, is up for download at CLAMP no Kyoto Agaru Sagaru‘s official website. This episode’s guest is Kotani Kinya, who sang the theme songs for the Tsubasa TV anime and movie adaptations. As expected, they basically spent the entire episode interviewing him. I am not a big fan of his music, personally, but he speaks very respectfully about CLAMP, he seems genuinely to be a fan. He said he knew Tsubasa before he was chosen to sing the theme song, and that’s nice. As mentioned previously, this the last episode of Season 1. At the end of the episode each member delivered a message thanking all listeners. It was a cute moment. Apparently there will be a Season 2 at some point, but no date has been given yet. Probably in October again? I really don’t know. But I really hope it’ll be back, because I really love this show and we always got little news out of it. Episode 30 is up for download at CLAMP no Kyoto Agaru Sagaru‘s official website. The episode was pretty much all centered on Mori Seigen and very little on CLAMP, so it wasn’t that interesting in my opinion. Next week will be the final episode and will have Kotani Kinya (the singer of Tsubasa Chronicle OPs) as a guest. Ohkawa hinted that this is only the end of “season 1” of the show, which could mean that there will be a season 2 after a period of break. I really hope so because I love this show. Episode 28 is up for download at CLAMP no Kyoto Agaru Sagaru‘s official website. They started the episode reading a message from a long-time fan (they follow CLAMP since RG Veda was being serialized). The person wrote that right now they like Tsubasa and Kurogane, that they were very sad that Nirai Kanai hen was over and they are looking forward to the next story. Ohkawa then mentioned the tankoubon release coming in July and the Playbutton which she’s going to write the script for. She told the listener to look forward to hearing Kurogane in that audio drama. Ohkawa didn’t mention anything about Tsubasa‘s next story. Next, another message from a different listener, this one wrote about the April Fool’s prank they did in their twitter account — they transformed their twitter account in a fictitious Detective Agency ran by Watanuki. It seems like they planned everything only a day before, on the night of 03/31. At the end of the episode, a surprise! The ending narration requesting questions, which is usually narrated in Japanese, was also narrated in English this time! So cool =) Does this mean is OK for them to receive messages in English? Start sending your messages in English, everyone! Episode 27 is up for download at CLAMP no Kyoto Agaru Sagaru‘s official website. Unlike the previous episode, this one they barely talked about their works. They started the episode reading a message from a listener who asked if CLAMP had any mascots (Yuru Kyara/ゆるキャラ) that they liked, so each of them picked their favorite non-CLAMP mascots. Next, another message from a different listener, this time asking for CLAMP’s recommendations on where to eat delicious sweets in Kyoto. They spent a few minutes talking about it. At the end of the episode, they congratulated Iwao Junko for having her own radio show in KBS Radio, which will debut on April 3. 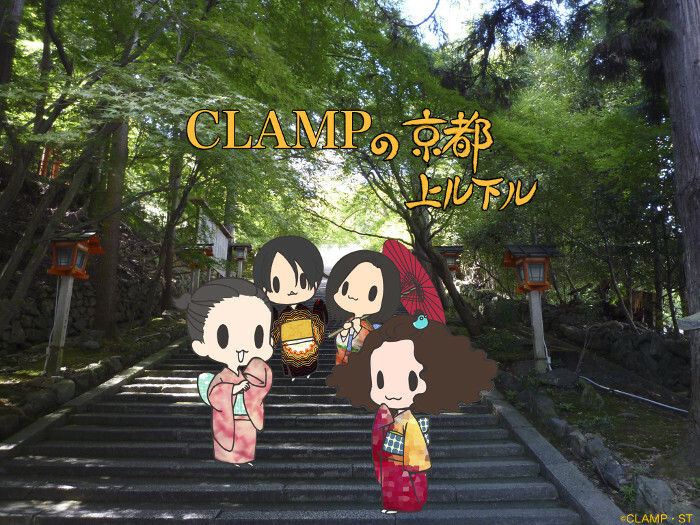 The ladies of CLAMP have been fooling around over at their twitter account. It says they are on holidays and they’ll open again on April 3rd, hummmm… what are they up to? Their twitter account now mimics a detective agency and Ohkawa’s account became the agency director’s account (who is called Watanuki Kimihiro). Episode 25 is up for download at CLAMP no Kyoto Agaru Sagaru‘s official website. This episode’s guest was Mika Kikuchi (Mokona’s seiyuu), so they basically spent the entire episode interviewing her. At one point, around halfway through, Mika Kikuchi interviewed CLAMP a little bit, too. I apologize for not having anything else to add about this episode, I just find it more interesting when it’s just the 4 of them.